Two of our neighbours in Cavendish Road have relaid their front paths in true Victorian style, and what an entrance they have made! They have used the right tiles with square-cut edges, not the rounded modern alternatives which never look as good. ‘I do like the traditional look,’ says the owner of the house on the right, who acted as project manager. He has found Victorian rope-top border tiles to trim the sides of the paths and commissioned new railings, complete with decorative pineapples to top off the gate posts. ‘The visitor had to be left in no doubt as to the owner’s position in society,’ wrote Robin Guild in The Victorian House Book, discussing the importance of the front entrance. Attitudes have changed since this south London house was built in 1893, but the truth of the statement is still evident more than a century on. Use the right architectural detail and you will impress. 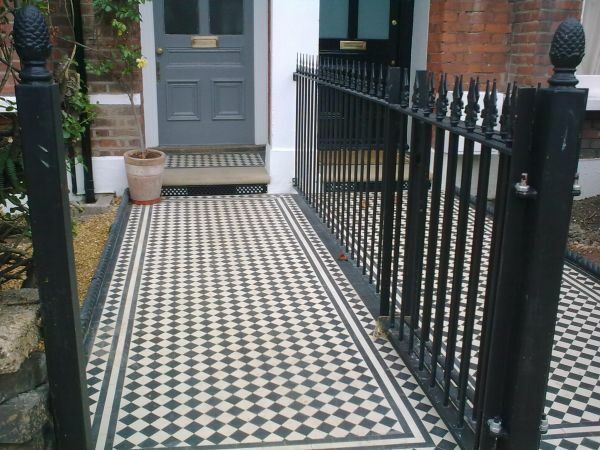 These tiles were laid by the Victorian Tile Co., 07976 937 667.